Alright, I know what you're thinking, isn't this post a little late? And the answer to that is YES but, better late than never (I know, I know; cliche - whatever). As you can tell I decided to go with the blog from blogger due to its ease of use. Most of my posts will be coming from my iPhone and I needed something that would integrate into my "on the go" lifestyle. Hopefully I'll be able to stay on top of it. Stay tuned and hopefully a couple times a week I'll have something worth talking about. PS. 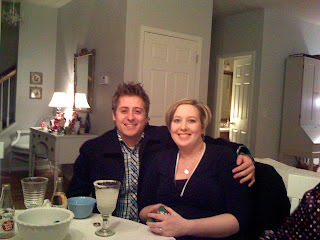 The following Photo is from New Year's Eve at the house of our friends Matt & Mindy. Dang that house is nice and those drinks look delicious! You must have really awesome friends. You know the type that need to make themselves feel better by posting comments about themselves on your blog. Seriously though, I'm so jealous you can update your blog from your iphone. You have no excuse to not post new stuff. I mean what else are you going to do during church? This is the 5th day I've checked this blog and still no update.